Fantasy Kingdom, located at 1422 N. Kingsbury (just west of Chicago’s Gold Coast), is far and away our favorite children’s birthday party venue. The facilities are well designed and the staff is service-oriented and eager to ensure your event is a success. You can drop your decorations, plates, goodie bags, etc. off in advance and they will have everything set up by the time you arrive. The layout flows well. There is a reception area (perfect for adults to hang out), a fully loaded play area, and a second play area for young babies. The main play area includes costumes, plastic vehicles, pretend rooms, forts with slides, and much more. After the kids run around, explore, discover, etc. 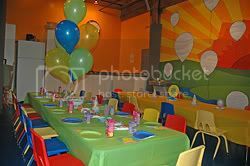 in the play area, everyone shifts to a dining area that is outfitted with kid-sized tables as well as high chairs for babies. In the meantime, gifts are collected into a large red wagon and then transferred by the Fantasy Kingdom staff to your car. This venue is perfect for a first birthday right on up through about 6 years old. It can hold a large group but still feels intimate. Private and semi-private options are available. My Gym, another good option, is located at 1880 W. Fullerton just west of Lincoln Park. Here the emphasis is on physical activity with a neat variety of gymnastic, climbing, jumping, sliding, and swinging equipment. The My Gym staff offered a nice blend of free play combined with organized special activities like circle time stories and taking turns riding the custom swings. Similar to Fantasy Kingdom, the kids take a break for cake; here the changing area is reconfigured and the kids are seated in a single file row which is not quite as nice as sitting around tables (and it does not work for babies). Windy City Fieldhouse, where we hosted a third birthday party, is located at 2367 W. Logan Boulevard (just west of Lincoln Park). 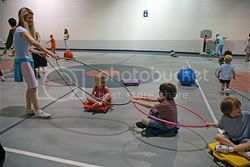 The party was held in a large gym loaded with balls, jump ropes, wheeled carts, and a lot of other fun stuff. 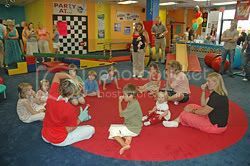 The staff attempted to organize some group activities but the space is too big and the kids were too wild to participate. Our gym play was followed by cake upstairs. This aspect of the party was disappointing, as they are just not equipped for a children’s event. There was no advance set up, the tables and chairs are adult sized (too big for toddlers), there was no designated place to collect gifts or layout goodie bags for guests, and when it came time to serve the cake, they did not even have a knife (we struggled to cut our birthday cake with a plastic fork). Unlike Fantasy Kingdom and My Gym where the staff took care of everything, we cut and served the cake ourselves as the staff watched. When the party was over, the staff piled all the gifts into garbage bags, mixing up the gifts and the corresponding cards. There is no doubt the kids had a blast and the gym is pretty amazing, but as parents, we walked away feeling a bit annoyed. The Kids’ Table is a creative venue that was recommended to me by Kai Schirmacher (Vice President of Residential Sales for my real estate team at Coldwell Banker Residential Brokerage) and his wife Amanda. They recently hosted a second birthday party for their daughter here. The party was essentially a group cooking experience for children. The party started with each child decorating their own chef’s hat. They then got to make their own individual-sized birthday cake- from scratch. While the cakes were in the oven, they make fresh-squeezed lemonade and fruit sculptures. After the cakes had cooled, the kids decorated their cakes and ate them. The venue is not too big – perfect for an intimate group. If your kids tire of the real thing, there is also a pretend kitchen loaded with wooden food and cooking equipment standing by! Finally, if you prefer to host your child’s birthday party at home, then I strongly suggest you consider a “pool party.” We recently attended a first birthday party complete with a water table and two different sized wading pools. The hosts had plenty of baby block, pool diapers and towels on hand. In addition to buckets and bubbles, they provided large professional paint brushes so the kids could “paint” the deck with water. It was a big hit. Regardless of where you plan to hold your child’s party, there are a few resources that you should know about. Invitations. I frequent two venues for all my stationary and invitation needs: A Marvelous Party at 2121 N. Clybourn and All She Wrote at 825 W. Armitage. Both offer a superior array of paper goods, but Marvelous Party is a little more service-oriented and you can park for free in the lot shared by Treasure Island Grocery. If you live in the Gold Coast or plan to shop on Michigan Avenue, you might also try The Watermark at 34 E Oak Street. Nancy Gross, the owner of this intimate stationary boutique, is very knowledgeable and service-oriented. Cupcakes and Cake. Sweet Mandy B’s located at 1208 W. Webster in the heart of Lincoln Park is an old fashioned bakery that draws huge crowds and rave reviews. Their cupcakes are an icon, although they also bake great cakes and cookies. Sweet Mandy B’s will bring out the kid in anyone, regardless of age. My other favorite Chicago bakery (and definitely my first choice as a source for cakes, chocolate, cookies or pastries for adult events) is the House of Fine Chocolate. This third generation family bakery is located in Lakeview on Broadway. Party Favors. If you are the sort of person who plans ahead, be sure to check out Oriental Trading. They offer an incredibly diverse array of party favors, decorations, and much more! Enjoy, and be sure to comment with your own favorite venues. If only we lived closer – such venues are not, sadly, abundant out here in the country. Aiden turned 3 with a BBQ in our backyard, but there was a great wooden swingset which Mike built himself! 🙂 Great blog, by the way. Can’t believe you have one. Good post. Have bookmarked your blog and will surely come back. Hey, I personally loved the Fantasy kingdom, i mean the arrangements were superb, you just need to get in there! thanks for the informative post. These ideas are wonderful! I’m so glad to see so many different ways to celebrate this holiday! If you have time, I would love your feedback on my work. Thank you! This post planned my daughter's B-day parth. Outstanding. My daughter will celebrate her birthday next month, hope i can find a party place like this in New York. Really were the great place to celebrate children's party! 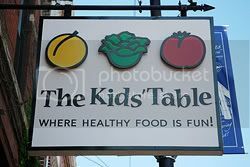 I love the The kid's Table, I've been there like months from now from I've remember and it was fun, the kids enjoyed there especially the food, yummy! And the chefs where really good. It was the birthday of my friend's daughter. I love the pool party idea! So many times we rack our brains to find the perfect spot to host a party. I keep forgetting that sometimes the best place of all is at home.